Pulai Springs Bhd, a hotel group and property developer, expects equal revenue contributions from the two divisions within the next two to three years. Currently, up to 70 per cent of the company's revenue comes from the hospitality division - its five-star Pulai Springs Resorts and the four-star The Pulai Desaru Beach Resort in Johor. Revenue from property development activities will be significant as the company launches more property projects within the resort as well as in Muar, Johor. In the financial year ended December 31 2009, property development contributed RM5.8 million in revenue while the hotel and resort division raked RM56.1 million. Executive director Nick Mah Siew Chean said that Pulai Springs plans to launch some niche developments within 3.2ha of land available for development within Pulai Springs Resorts. The resort covers 151.88ha of which 89ha are taken up by two 18-hole golf courses. A feasibility study is being conducted to decide if it should build semi-detached homes, bungalows, or high-end condominiums, Mah told Business Times in a recent interview. All these units are likely to be launched at the end of 2011. In Muar, it has 12.2ha of land for mixed development. This is the first gated community in Muar. The first phase of development, Maharani Ayu, had a gross development value (GDV) of RM30 million. The second phase, with a GDV of RM40 million, is in the planning stage and may be launched in early 2011. It will include semi-detached and terrace houses. The group also has some 3ha of land in Desaru, on which a preliminary study is being conducted. When asked about development plans outside Johor, Mah said it is looking for land in the Klang Valley. KUCHING: Naim Holdings Bhd has earmarked three high-end property developments in Miri and here for the largely untapped Malaysia My Second Home programme in Sarawak. Corporate services and human resource senior director Ricky Kho said the three projects with gross development value (GDV) close to RM400mil were scheduled for launch next year and in 2012. “The first property to be developed in Miri will comprise apartments, semi-detached and detached houses,” he told StarBiz yesterday. There will be two blocks of six-storey service apartment (72 units) and a 15-storey apartment (168 units) with a clubhouse. The proposed project with GDV of more than RM250mil will also comprise 53 units of semi-detached and detached houses, 44 detached vacant lots, a double-storey shophouse, a mini market and a restaurant. Naim is undertaking the joint-venture project on a 20ha land owned by Miri Malay Charitable Trust Board. Kho said the service apartment would be priced from RM800,000, semi-detached houses from RM750,000 and detached houses between RM1mil and RM2mil each. He said the second property scheduled for launch in 2012 would be a condominium project overlooking the scenic South China Sea near to Piasau Beach, Miri. With a GDV of RM80mil, the project will comprise 96 units which would be sold from RM800,000 each. Kho said the third project under planning in Jalan Upland here would comprise of town houses. “We see great potential in My Second Home programme in Sarawak as it is a largely untapped market. Sabah is doing quite well in promoting the programme. “There are many foreigners, including Singaporeans and Europeans, who are keen to participate in the My Second Home programme in Sarawak,” he added. Kho said Naim would market its proposed property developments under the programme abroad, targeting particularly the expatriates and retirees. He is confident that Miri as a resort city and its scenic beaches would appeal to foreigners looking for an ideal relaxed lifestyle. The Penang Turf Club, owner of the single largest plot of prime land in George Town, has called for bids to buy and develop 23.09ha on the island, sources say. The tender, called two months ago, closed on September 30 and speculation is that major developers already present in Penang, like Eastern & Oriental Bhd (3417), SP Setia Bhd, IJM Land Bhd and Mah Sing Group Bhd, would have put in their proposals. The club has been around since 1864, making it the oldest horse racing club in Peninsular Malaysia, and owns some 104ha. However, it is unclear if the remaining land is available for sale or slated for development. Property valuers say the price for that 23ha site could amount to between RM160 million and RM180 million. It is understood that some 16ha are on a hill. A valuer contacted by Business Times, who had said that the piece of hillside land in Penang could not be developed, quoted the price at between RM30 per sq ft and RM40 per sq ft. The land below the hill has more value at about RM150 per sq ft.
Sources said that the racecourse was not part of the sale and development plans. The Penang Turf Club could not be reached for comment. Plans for the club's redevelopment came to an end in 2008 when Chief Minister Lim Guan Eng rejected a proposal from Equine Capital Bhd associate company Abad Naluri Sdn Bhd due to its failure to submit plans as required by the state. The land was slated for the RM25 billion Penang Global City Centre project. Later reports quoted the club's plans to build 25 bungalows to obtain rental income to fund operations. Members had voted for the project comprising detached and semi-detached houses, and slated for completion by end-2012. The maximum density allowed for the area is six units per 0.45ha and the development will not interfere with the running of the club. Penang's retail and dining scene is set for a fresh wave when Eastern and Oriental (E&O) Bhd unveils its first retail outlet. The sea-fronting Straits Quay retail marina enclave, which covers a net lettable area of 270,000 sq ft, which will be operational by the end of November. It is expected to raise the bar for the island state, as efforts are being made by its developers to place the mall on the tourism map. The mall which is made up of three levels and will accomodate 100 tenants, forms a component of E & O's waterfront development Seri Tanjung Pinang which is located at Tanjung Tokong on the island. Besides boasting the entry of new local and international brands into Penang at Straits Quay, E & O is also looking to set up Penang's first performing arts centre at the same site. "Negotiations and discussions are underway at the moment to set up a performing arts centre in collaboration with one of the foremost performing arts proponents in the country," E & O Bhd executive director Eric Chan Kok Leong told Business Times. He also said that an arts and crafts enclave is also under negotations which is set to showcase Malaysian works, with a special emphasis on Penang craftsmen. E & O is also set to bring its Delicious Cafe to Straits Quay. With projected investments of RM5 million, "Delicious at Straits Quay" will serve as E&O's sixth Delicious Cafe outlet and its first foray outside the Klang Valley. "Future plans include being on the lookout for more prime sites within high-traffic retail areas, as well as the ambition to branch overseas, such as in Singapore," Chan said. He said nearly 80 per cent of the prime lots or those facing the marina on the ground floor have been leased. Among the confirmed tenants are the Melium Group's Aseana Cafe, Cheeky Duck chinese restaurant, Hisago Japanese restaurant, French deli Agua and Italian eatery Marina Aperitivo. Other confirmed tenants include Finnegan's Irish Pub and Restaurant, an English language education centre, Italian fashion label Versus Versace and home-grown fashion label Bran-et-daguet. "Straits Quay will be targeting the middle to upper income, family-oriented consumers, as well as local and international tourists," Chan said. "The marina setting, water limousine as well as the unique complement of outlets and attractions will provide a strong draw for local and foreign visitors," he added. He said that E & O will be introducing a water limousine service in the future which will establish a strategic connectivity between Straits Quay, the Eastern & Oriental Hotel and Lone Pine Hotel, which are properties owned by the company. The residents of the properties managed by Sunrise Berhad (Sunrise) in Mont’Kiara and Dutamas can now enjoy the fastest broadband connectivity in the country with speeds of up to 50Mbps. The service enabled by TIME Fibre Broadband™ is available for free at the Sunrise Fun Zone Community Centre in Mont’Kiara. “With the installation of TIME Fibre Broadband™, our residents can enjoy broadband speed that has never been experienced before. Their daily online retrieval of information, entertainment and news will be much faster with no disruptions. Our residents can enjoy this service either at the Sunrise Fun Zone, on a complimentary basis or in the comfort of their homes, upon subscription,” said Sunrise’s Assistant General Manager of Branding and Community Development Anne Tong at the launch ceremony. “By providing a reliable and superior broadband service, we are able to enhance the community centre’s superb facilities and add on to the many exclusive privileges currently enjoyed by our residents,” she added. The deployment of TIME’s fibre-to-the-home (FTTH) broadband service makes Sunrise the first developer in Malaysia to secure the fastest and most reliable broadband connection for its exclusive enclave of residential and commercial developments. Besides offering the fastest broadband connectivity in the country, with TIME Fibre Broadband™’s 100% fibre optic technology direct to homes or premise, users will not face the problems that plague wireless technology, such as congestion in the airwaves and will not be susceptible to interference. “Through our working relationship with Sunrise, we were able to deliver the first fibre-to-the-home broadband service in Malaysia to the residents in their development. These residents are amongst the few people in the country who get to enjoy the fastest and most secure broadband with TIME Fibre Broadband™. 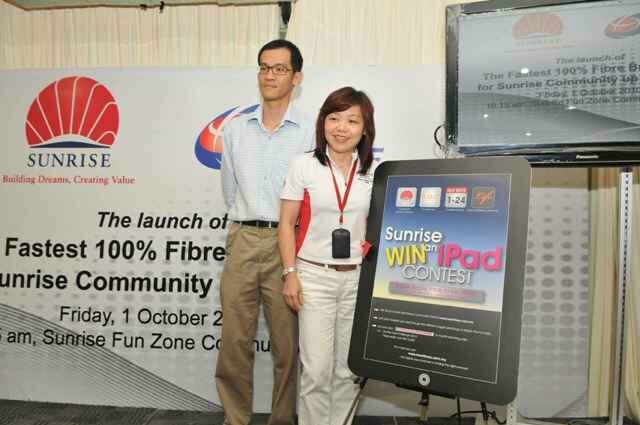 Today, we are once again honored to work with Sunrise in providing this service at the Sunrise Fun Zone Community Centre for all their residents to experience the amazing speed of 50Mbps,” said Head of Product at TIME dotCom Berhad Joey Phang. At speeds of up to 50Mbps, residents can perform seamless file sharing, “zero-lag” video conferencing, and download high-definition (HD) content. They can also download full-length, high-definition movies in less than five minutes, TV shows in 30 seconds, and music albums in five seconds. Open to all, the 'Sunrise Win an iPad contest' offers fantastic prizes. At the Sunrise Fun Zone Community Centre, children can tap into interactive educational sites to gather information for school assignments or revision aid while parents work on their portable computers as young children engage in regular activities at the centre. Eleven properties developed by Sunrise and managed by its subsidiary SCM Property Services Sdn. Bhd., are already enjoying the nation’s first 100% FTTH connection by TIME Fibre Broadband™. They are Plaza Mont’Kiara, Solaris Mont’Kiara, Mont’Kiara Pines, Palma, Sophia, Bayu, Astana, Pelangi, Aman, Damai and 10 Mont’Kiara. Extension to all its other properties including mix-use development Solaris Dutamas is expected by year-end. Invited guests had a chance to experience unimaginable download and upload speeds via a LIVE demonstration at the event. Sunrise also launched its ‘Sunrise Win an iPad’ Web Contest on its community portal “Life@Sunrise Mont’Kiara”. As a community developer with a holistic vision, Sunrise will continue to improve the livability and sustainability of Sunrise Mont’Kiara, offering new and innovative services to cater to the evolving needs of our customers. Hong Kong axed its first land auction in 16 years last week after property-mad developers were scared off by the site's location -- next to a cemetery, considered a bad omen by Chinese buyers. Soaring property prices have sent the financial hub's government into action over the past year, staging half a dozen land sales to boost supply and cool an overheating market amid fears of a housing-price bubble. The land sales sparked huge interest from buyers, including Hong Kong's richest man Li Ka-shing, given the scarcity of real estate in this densely populated city of seven million. But the cemetery plot, about 20 minutes' drive from Hong Kong's glittering financial district, was deemed too spooky for the highly superstitious Chinese. "It's very unusual -- there is always a shortage of land in Hong Kong," said Alnwick Chan, executive director at property consultancy Knight Frank. "But the (building) would overlook cemeteries. That is quite an issue for the Chinese population. It has perceived bad luck and would always have this haunted feeling. "The site is surrounded by cemeteries and tombstone workshops, a far cry from Hong Kong's highly prized views of the South China Sea or emerald green hills. Auctioneers pulled the site after just a few minutes on Tuesday with the plot failing to draw even one bid for its 530 million Hong Kong dollars (68 million US dollars) opening price. Surveyors had estimated it might fetch as much as 780 million Hong Kong dollars. On the same day, a site in the city's outlying New Territories fetched a higher-than-expected 459 million Hong Kong dollars, throwing cold water on any suggestion that Hong Kong's property market is softening. "I believe it's an isolated incident," Buggle Lau, chief analyst at Hong Kong property broker Midland Holdings, said of the failed sale. "The other site received an overwhelming response. "The aborted sale was Hong Kong's first since 1994, when a plot of land was also pulled off the auction block after garnering zero interest. The cemetery site's close proximity to a slope would also hike developers' costs, while its location in a middle-income district might hamper demand for flats in a high-margin luxury building, Lau told AFP. Worst of all, the upper floors -- which usually fetch the highest prices -- would have the clearest view of the vast cemeteries, he added. Mainland Chinese buyers, who account for as much as half of the luxury residential sales in Hong Kong, would shy away from investing in the unlucky property, said Yu Kam-hung, a senior managing director at CB Richard Ellis. "The marketability would be limited," he told AFP. In August, billionaire tycoon Li snapped up two prime residential sites for a combined 7.61 billion Hong Kong dollars -- well above market estimates. Developers have remained upbeat about Hong Kong's residential market despite government measures to rein in prices, including boosting land supply and tightening mortgage lending. Hong Kong house prices have surged nearly 45 percent from their trough at the end of 2008, while prices of some luxury flats have returned to, or surpassed, the peaks of the 1997 property boom.